What is the Yamaha S Series? 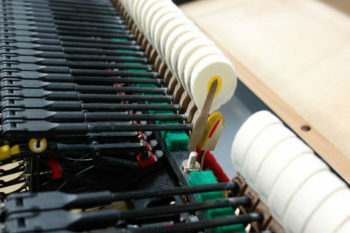 In a nutshell, the S series are Yamaha’s concert level, hand made pianos. Made in a separate factory, these 3 models, the S4 (191 cn, 6’3″) , S6 (212m, 6’11”) and CFIIIS (275cm, 9′) (pronounced C F three S) are made using techniques that would be familiar in any high end piano factory. Lots of hand chisels, a relaxed but intense pace working with materials that are chosen with less regard to the price. The result is a piano with much more character, range and overall playing quality with the distinctive sound Yamaha strives for in their concert instruments.